A lawsuit filed Friday by California's Attorney General seeks to stop fast food (and other) restaurants from serving french fries without an explicit warning about Acrylamide. Acrylamide is a chemical that studies have found is created when starchy foods are cooked at high heat. 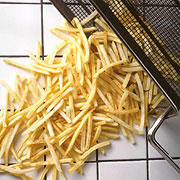 The U.S. Food and Drug Administration is studying the impact of acrylamide levels in food. In a March press release, the FDA said "acrylamide can cause cancer in laboratory animals at high doses, although it is not clear whether it causes cancer in humans at the much lower levels found in food." In other bad news for french fries, another study has shown that young children who eat French fries frequently have a much higher risk of breast cancer as adults.